When you live for weekends on the water, your kayak or canoe is your prized possession. It’s more than a piece of gear—it’s your ticket to beautiful views, restorative trips, and the opportunity to unplug and reconnect. That’s why it’s so important to have a storage system. Although there are a lot of options out there, the best one will be easy to use, lightweight, portable, and affordable, while still offering all the benefits you expect from a quality storage system. 1. 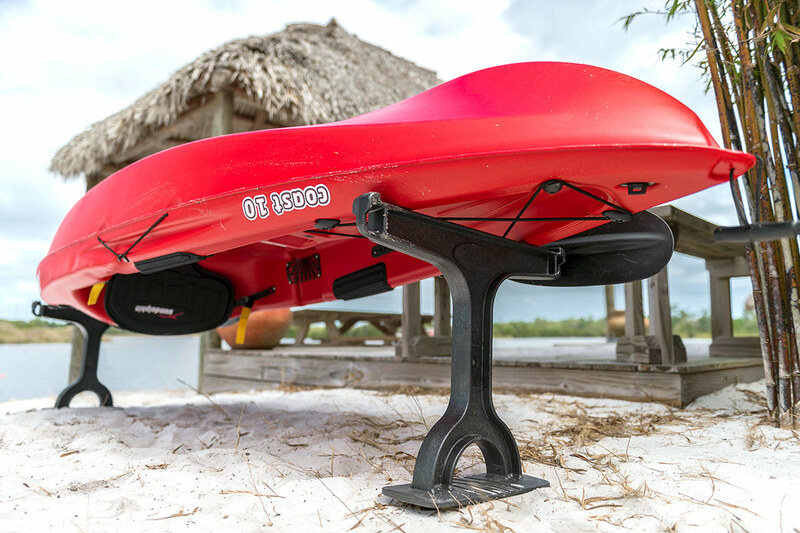 It protects your kayak from the elements. Picture this: you get home from an awesome day on the water. You’re in a great mood, but you’re also tired and a little sunburned. All you want a shower and a beverage, but first you must put your gear away. Do you drag your kayak into the backyard and leave it in the dirt? Scrap it along the cement floor as you push it against the garage wall? Leave it on top of your car for the next five days? We certainly hope not, since all these options leave your kayak vulnerable to damage, uninvited guests, mold, and insects! The best way to thank your kayak for a great day is to take five minutes and put it away properly. The Shore Tee makes that easy. Simply lift your boat, flip it upside down, and place it on the Shore Tees. Once your boat is in position, it takes an extra 30 second to blast it with a hose (if you’ve been paddling in salt water, a good rinse will keep your kayak or canoe from corroding). That’s it—you’re finished, and your kayak is much safer and more secure. Now go enjoy that icy cold beverage, guilt-free. 2. It’s easy to install, so you’ll actually use it. Walk through any outdoor store and you’ll see at least ten different options for storing your kayaks and canoes. Most of these are complicated, involving hardware, power tools, and permanent holes in your walls or ceilings. Trying to untangle multiple straps and balance your boat in unnatural positions is a headache—you might be tempted to skip the storage step entirely. Avoid these issues with the Shore Tee. This storage solution is tool free—unless you count your foot. Just drive the Shore Tee into the ground and you’re done. You don’t have to drill holes into your wall or build a separate unit for your boats. This is especially good news if you rent a home—no reason to risk your security deposit! 3. It distributes weight evenly. One of the most important things to remember when storing your kayak is to make sure the boat’s weight is evenly distributed. If it’s off-kilter, the hull can become morphed or dented, which will make paddling in a straight line impossible. The Shore Tee makes this issue a nonstarter. Because it comes with two stand-alone pieces, you can adjust them easily at either end so your kayak is perfectly balanced. It also works for boat of any size—simply move the Shore Tees closer together or further apart until you find the right fit. Windy day? No worries. The Shore Tee is designed with clever eyelets so you can tie your boat down, keeping it exactly where you want it. Storing your kayak safely and securely is the best way to ensure it has a long life and you get years of enjoyment out of it. Do you and your boat a favor, and try the Shore Tee today.